If there’s one thing telcos are indisputably king-of-the-hill at doing, it’s value-based pricing and tariff obfuscation. Even the airlines with their sophisticated yield management systems and variable pricing don’t come close. The airlines’ forte is price discrimination, which is selling basically the same thing to different people at different prices based on willingness to pay. Airline prices are easy to compare, and the product is fairly homogeneous — we fly you from A to B.
Telco bundles are deliberately fiendish to compare. The services are quite diverse (e.g. SMS, video calls, broadband, handsets and a zillion phone call rates), which gives plenty of scope for innovation in creating a unique non-comparable packaging of the offer. There’s a whole sub-industry grown up around this. There’s just one, small, tiny problem. We don’t believe this skill is going to be a critical factor to being successful in a Telco 2.0 world, where abundance, flat-rates and low internal costs of sales, billing and support are key themes. 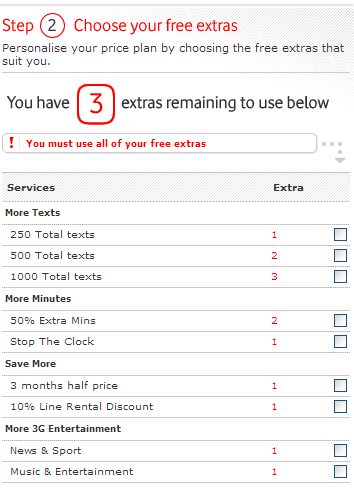 Let’s make a small case study out of Vodafone UK’s current promotion. We’re picking on them, but most other operators would do just as well: only a few, like T-Mobile, 3 and Sprint have made any serious effort at simplifying their pricing. Vodafone has a weaker position in the UK consumer market than you might expect. (Their enterprise offerings, as always, continue to sell well — these were the early adopters right back to the analogue cellular world, and Vodafone’s DNA is built around them.) They’re doing some positive things to help change this, such as family plans. Vodafone Family. Unlimited calls between four people. Now family plans aren’t anything new — in the US market they’ve been around for ages. Keith has done a good job of explaining how this move may strengthen Vodafone’s market position. 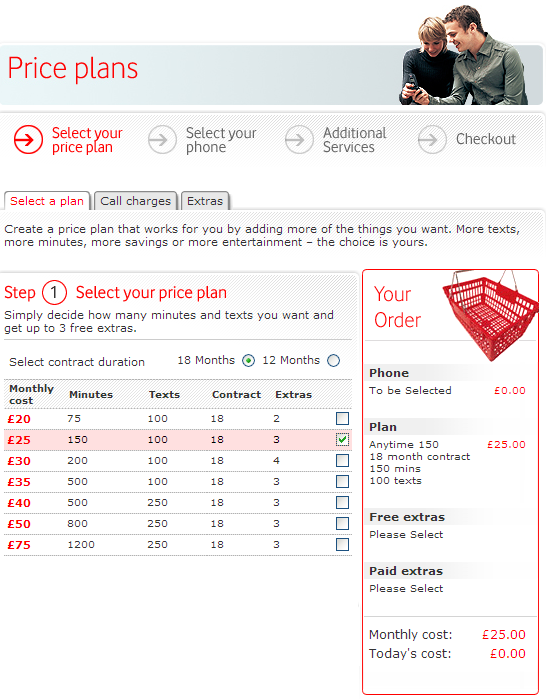 The problem is that Vodafone can’t seem to choose between simplicity and complexity in its pricing. A family plan is about predictable pricing and removing “metered minute anxiety” in close social groups. Let’s click through their web site to buy a service plan. So far, so good, although these plans are not particularly competitive: the strategy is to ask for lots of money, and then sweeten the deal by offering lots of added-value extras which have low marginal cost to Vodafone but relatively high perceived user value. Finally, the family plan promotion re-surfaces. If it’s what you were looking for at the outset, you’ve had a long wait. What Vodafone need to concentrate on is simply closing the deal. They assume that they’re more special than they really are, and that consumers will be patient enough to wade through their marketing maze. That’s it. One choice: how much do you want to spend? Now, Virgin Mobile have their own execution and strategic woes, but as a consumer marketing operation, it’s hard to beat. Pip Coburn’s recent book The Change Function talks about perceived pain of adoption in how new technologies and products are adopted. 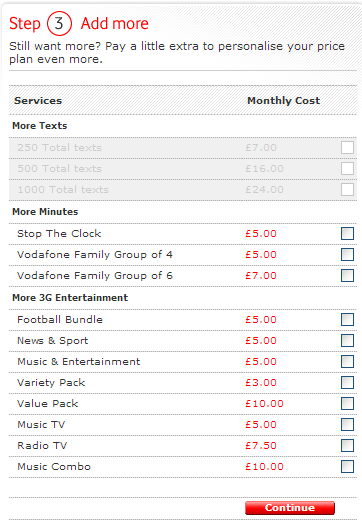 What Vodafone are doing is increasing the non-money search and transaction costs for users. They’re also infecting the rest of their brand proposition with a taint of complexity. It might not seem like a big deal, but Vodafone have consistently underperformed in the consumer market, despite their scale of operation and favourable on-net economics. Apple’s iPod took out the complexity of ripping, filing and filling — and presented a stripped-bare user interface. The perceived pain was low. (It was also sold on the benefits of songs and style, not acronyms and features.) Yet the problem persists in the entertainment world, where DRM encumbers every purchase decision with additional implicit costs. More acquisition pain, lower sales. The airlines have also followed the same path, with Southwest and Easyjet forcing simplified pricing on the “majors”. Consumers don’t want to be bamboozled, and fear being ripped off. The alternative to value pricing is abundance pricing. We’ll give you lots of it — lots and lots. It need not be cheap, but it will be predictable and simple, and you won’t be faced with choices, decisions and buyer’s regret at every turn. You then tier your market based on quality. In the case of telephony, you’d offer “business” quality services like wideband audio and enhanced voicemail to separate out the price-sensitive customers from the rest that way instead. Vodafone’s chief, Arun Sarin, recently said that flat-rate was the future. Maybe it’s time for the marketing to catch up with the leadership intention? We’ll be looking more into the degeneration of pricing as a marketing tool in our forthcoming report on the future of the voice and messaging business. What a neat example. Very customer centric. As you probably know here, the big issue is what the "offer of simplicity" (i.e. 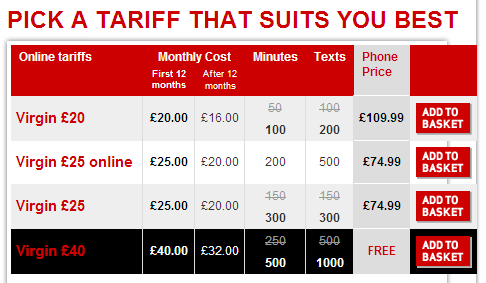 simplified pricing) "costs" the telco. If they loose shavings off the price, they loose big money over the "long tail of their customers" (i.e. the non switchers).